Over the past decade there has been a notable shift toward more standardized voting methods and integration of online resources. Although these changes all aim to make voting more efficient and inclusive, there is not yet a definitive consensus on any single method. Before 2010, only two states (Arizona and Washington) had online registration systems in place. Since then, there has been an explosion of state action to usher in online registration systems. In fact, there are now 31 states plus Washington D.C. that offer online voter registration programs as of March 2016. Most states only require basic information plus a driver’s license number in order to register online. Because of these systems, voter registration has become more accessible, more cost effective and has faced no known security breaches to date. Also known as Direct Recording Electronic voting machines (DREs) usually involve a touch screen machine where voters can select their preferences. Supporters of DREs claim that they enable a faster and more accurate voting process. Some electronic machines provide a Voter-Verified Paper Audit Trail (VVPAT), which allows the voter to review their selections before casting their ballot. Many disability rights advocates support this method as it provides the greatest accessibility. The font size is adjustable, audio recordings can be included and a touch screen is easier for many people to interact with. Voting with optical scanners involves paper ballots marked by voters to indicate their preferences. The ballots cast in this system are fed into an optical scanning machine, which reads the selections the same way as standardized tests. Advocates of this method point out that optical scanners allow people to verify their ballot and creates a paper trail independent of software. Overall, about 60% of U.S. counties use optical scanners and the rest use some form of DREs. Click the map below for an interactive look at what technology states use to administer voting. Minnesota’s online registration system went into place in October 2013, and was later approved for use by the state legislature in early 2014. In the first year of the system leading up to the 2014 election, Minnesota had over 20,000 voters register online. The entire state uses paper ballots and optical scanners as the preferred voting method. 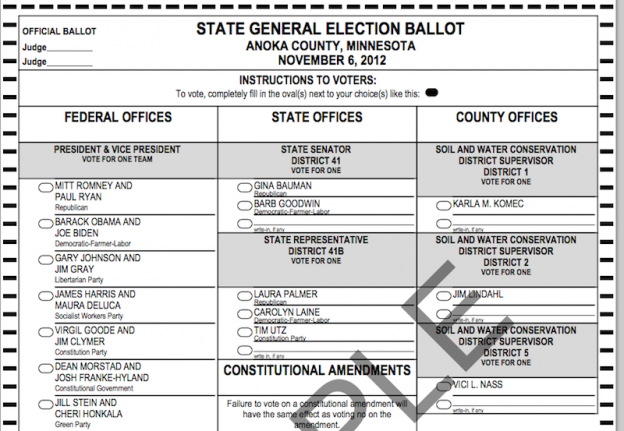 However, Minnesota also offers the AutoMARK system to display ballots with larger print and higher contrast to allow voting without using the traditional ballot and marking with a pen.